More than 1,200 species of bats exist worldwide, with 47 species living in the United States. The main predators of night-flying insects, bats play an important role preserving natural ecosystems. 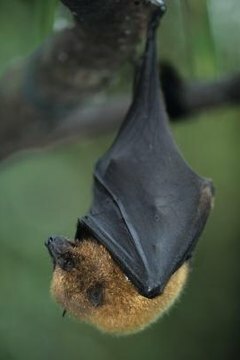 One-third of all bats consume fruits and nectar, dispersing seeds and pollinating plants as they forage. The smallest bat weighs less than a penny, the largest has a 6-foot wingspan. The four major groups of bats are free-tailed bats, ghost-faced bats, leaf-nosed bats and vesper bats. Three types of free-tailed bats are found in the U.S. Mexican free-tailed bats and western Brazilian free-tailed bats inhabit the western U.S., Mexico and northern South America. Eastern Brazilian free-tailed bats are found in Kentucky, South Carolina and south through Florida. Free-tailed bats are gray or reddish to dark brown, with 12- to 14-inch wingspans. Insectivores, they roost near water in caves, attics, abandoned buildings and under bridges. Ghost-faced bats weigh about a half-ounce with 15-inch wingspans, and have dark or reddish-brown fur. Short, round ears form pockets around their eyes, and they have leaf-like skin growths on their chins. Texas, southern New Mexico, Arizona, Mexico and Central America are home to ghost-faced bats, which feed on insects, foraging high above the ground. Cave dwellers, they roost on the ceilings of caves, tunnels, abandoned mines and deserted buildings. California leaf-nosed bats are the only leaf-nosed bats in the U.S., inhabiting California, southern Nevada, southwest Arizona and northern Mexico. Their upper bodies are gray or dark brown, with pale underbellies. Leaf-nosed bats have very large ears and an erect triangular skin-flap on their noses. Their wings are short and broad. Leaf-nosed bats hunt insects in flight and on the ground. They roost in caves, rock shelters and mines in the Sonoran desert scrub. Vesper bats, known as evening bats in some regions, are the largest bat family. This includes large brown bats, Indiana bats, hoary bats, long-eared bats, pallid bats and many others. Vesper bats have small eyes, no nose-leaf, fleshy ears and long tails. They exist throughout the world, with the exception of polar regions and remote islands. Species, sizes, wing shapes, feeding and breeding styles, and roosting habits of vesper bats vary widely. What Does the Aye-Aye Usually Live In?